少林禅城 Shaolin Chan City: "Traditional Shaolin Stance Training", by Shi Xingmi. "Traditional Shaolin Stance Training", by Shi Xingmi. The following is a look at the method and role of traditional stance training in Shaolin practice, written by Walter Gjergja. 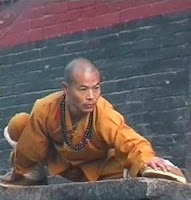 Walter is a 32nd Generation Shaolin Disciple under Master Shi Deyang (Chin. : Shì Déyáng Fǎshī 释德扬法师) and co-founder of Shaolin Wuseng Houbeidui - Italy, with the Dharma-name Shi Xingmi (Chin. : Shì Xíngmí 释行米). Today traditional Shaolin stance training is often misunderstood, neglected, or interpreted in a much more limited way than its intended purpose. 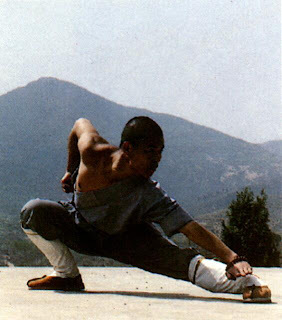 Stance training has for centuries represented an important part of Shaolin training, often considered a fundamental element without which most other aspects of the discipline would be impossible to understand, perform correctly, and have any martial efficiency. Often it is argued that as a means of physical preparation stance training has today been surpassed by other more modern and scientific methods; this however is a conclusion that simply displays limited first-hand stance training experience, and limited understanding of the “science” of stance training and its multiple objectives. Stance training has a number of fundamental objectives, which can be divided in three main groups; technical, physical and mental. Stance training is first and foremost a way of learning an extremely complete, evolved and accurately defined method of movement, which, when applied correctly, will enable the expert practitioner to rapidly transition to any attack and defense position in a stable, fast, unpredictable and coordinated manner. Furthermore it teaches a set of postures which, when applied correctly, will enable the expert practitioner to control the opponent’s position and movements, simultaneously allowing the execution of a great variety of defensive and offensive hand and leg techniques with maximum power and whilst maintaining optimum stability. Stance training develops muscular endurance via isometric holds; by staying in a specific stance, for example mabu , for a prolonged period of time, substantial isometric tension is generated on the abdominal muscles, lower back, hips and all the leg muscle groups. Stance training also develops muscular strength via dynamic movements; by moving in and out of a stance, for example lowering and rising xubu , the practitioner executes various types of one-legged and two-legged squats and lunges with substantial load on all leg muscle groups as well as the trunk stabilizers. Furthermore it develops power via an alternation of the isometric holds and dynamic movements described above. Modern sport science has discovered that a sequential application of isometric holds and dynamic movements generates more power gains than dynamic strength training alone; stance training has always applied this principle, alternating the static hold of a stance to dynamic movement between stances. and consequently can contribute to develop both, via static (holding the stance) and dynamic (moving in and out of the stance) stretching postures. Stance training engages the practitioners in a challenging learning process which will stimulate coordination, balance, mobility, body-awareness, and other mental characteristics indispensable to a complete fighter. Furthermore by pushing the endurance of the practitioner this type of training can stimulate relaxation, concentration, resilience to fatigue and to physical pain. Most importantly, and quite uniquely, traditional stance training combines all the above technical, physical and mental training objectives, providing a single fundamental training foundation. 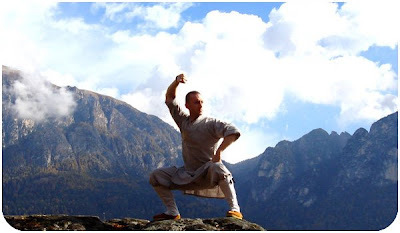 Normally traditional Shaolin stance training begins with simple exercises alternating single stances in both static holds and dynamic movements, ensuring maximum movement range to achieve all the strength and stretching benefits outlined above. The stances are then connected in static and moving sequences, initially without performing defensive or offensive techniques such as punches or kicks, but often with the inclusion of some hand posture to ensure correct body alignment and whole-body ‘tension’. Finally multiple techniques are added, both in short jibengong (basic skills) sequences and in a variety of taolu (boxing sets); the stances however remain the primary constant, and they should continue to be practiced also separately, as a stand-alone training routine. A traditional basic stance training routine can have almost infinite combinations; the following example is a short but challenging beginner sequence of exercises (mabu, pubu , xubu). It is important that each stance is executed correctly, with an appropriate hand posture, and that maximum motion range is achieved (within the physical capabilities of the individual). To increase or decrease the difficulty of the routine simply increase or decrease the height of the stance, the duration of the holds, and the quantity of the reps. Always perform a warm-up and light stretching routine prior to attempting stance training, and ensure correct posture and alignment is maintained, initially with the supervision of a competent teacher. 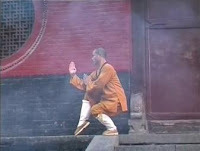 More advanced Shaolin stance training will then aim at exponentially raising the difficulty via the stimulation of greater and greater control; whilst the initial training as described above will provide the raw endurance, strength, mobility and posture foundations, the advanced exercises will add body-and-mind control difficulties. These can be for example the execution of the exercises whilst balancing on ever-higher and narrower poles, or on uneven and perilous surfaces such as rocky outcrops, or with control-enhancing elements such as small water-filled bowls balancing on the head, hands, legs. All these methods will stimulate ever greater muscular control, postural alignment, balance, concentration, focus and body awareness. Alternatively there are methods focusing more on enhancing the strength benefits of stance training, such as increasing loads by holding weights (traditionally stone locks and stone balls) in various hand postures whilst executing the stances, or performing more complex single-leg dynamic movements, or transitioning between stances with plyometric-like movements. 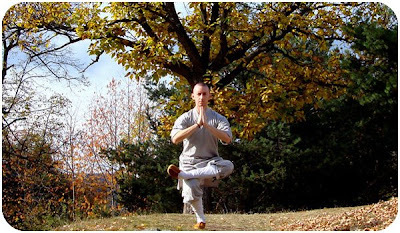 Traditional Shaolin stance training is therefore not just a unique method of movement, possessing great versatility as a means to train the technique as well as the body and the mind. As such it must be the foundation of any Shaolin training and in itself reflects perfectly the Shaolin training philosophy, one which always aims at combining physical, technical and mental training as one. Far from being dismissed as obsolete, sport science only confirms that traditional stance training can be an invaluable method which in many ways reflects the very latest scientific findings in its union of static and dynamic movements, maximum range of motion, and mental stimuli. “Shaolin martial arts begins with basics and ends with basics. At the start you will only do basics, because they are the foundations on which you will build all else, and at the end you will only do basics, because you will realize that all else is within them. Copyright © 2009 Shaolin Chan City, LLC. All rights reserved. Why isn't gongbu mentioned in this article? I would love to include it in my stance training. The author of the article, Shaolin Disciple Shi Xingmi, can be contacted via the website provided. Virtually any stance can, and should, be trained as described or in a similar fashion. I view this as a basic outline of traditional Shaolin stance training. It's not suggesting you only train these three, but they really target more intensely the muscles used in every stance. If you get these three really well, you'll have all the flexibility and strength needed for the other stances. The others should then be performed with more ease and precision as a result. Hi JingYi, I'm the author. All stances can and should be trained using little sequences, the one indicated in the article is just an example using three stances. Master Le Fujun, this is a very insightful article in SCC Blog. Many thanks also to Master Shi Xing Mi as the Author. As Master Le Fujun instruction thru e-mail, I have start stance training everyday and it is proven make me fresh, energetic and also more flexible in daily movement.